Choosing a domain name can be a daunting task. It’s sometimes easier to come up with the website idea than naming it. It can seem like the interesting and memorable names are taken. 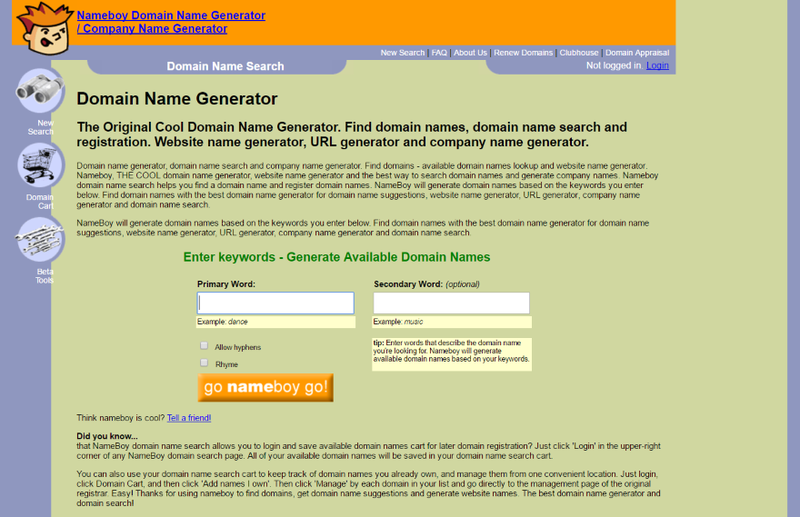 One easy solution is to use a domain name generator to find possible names based on your keywords. 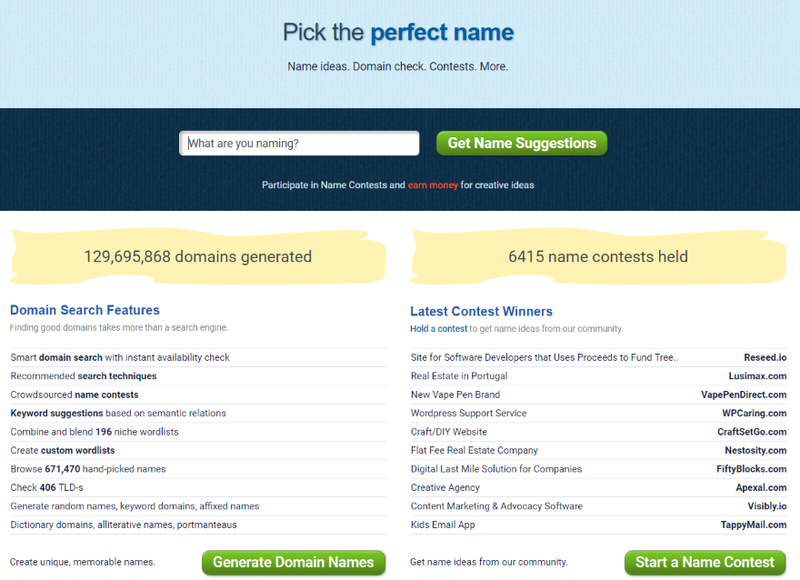 In this article we’ll take a look at the most popular domain name generators on the web. All are free to use. They use AI to offer suggestions. Sometimes the suggestions are good, and sometimes not so good, but they can get you started in the right direction. For advice on domain name best practices, see the article How To Find A Good Domain Name For Your New Website. 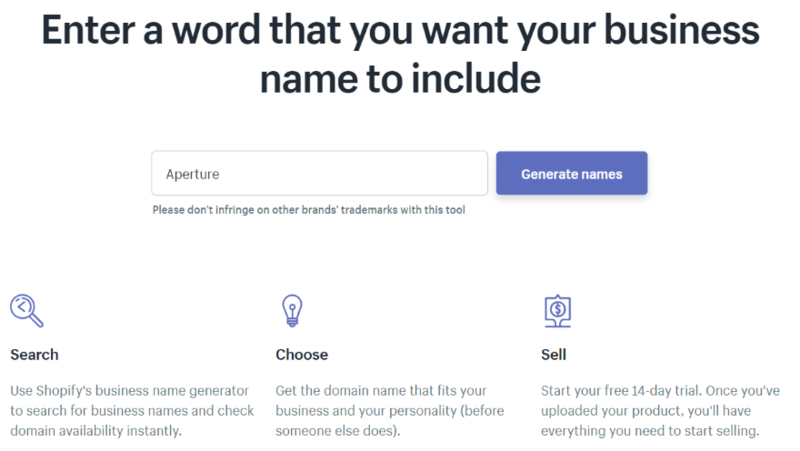 Shopify Business Name Generator is an easy tool to use. Type in one word that you want your domain to include and it returns thousands of available domains that include that word. The example I used added one word to my keyword and gave me 4500 choices. Instant Domain Search allows you to enter a keyword and then see dozens of domains that use that keyword. The results include suggestions, domains that are for sale with their prices and purchase info, WhoIs info, and detailed analytics for your keyword. Name Mesh displays results under categories such as New, SOE, Short, Common, Mix, etc., so you can see the results based on how they can be used. You can filter the results by setting the maximum length and hiding registered names. It also has a WhoIs check if your keywords are taken. It works best with 2-3 keywords. 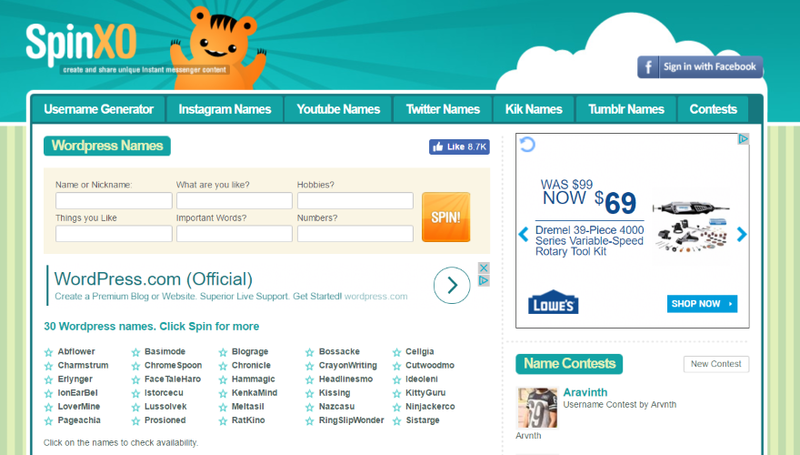 SpinXO WordPress Names provides suggestions based on your answers to several questions. Type in your name, what you are like, your hobbies, things you like, important words, and important numbers. It will provide 30 names. Click on the names to see their availability or click to spin again to see a new list of names. The availability check includes user name availability for the popular social networks. Lean Domain Search is from Automattic (the makers of WordPress). 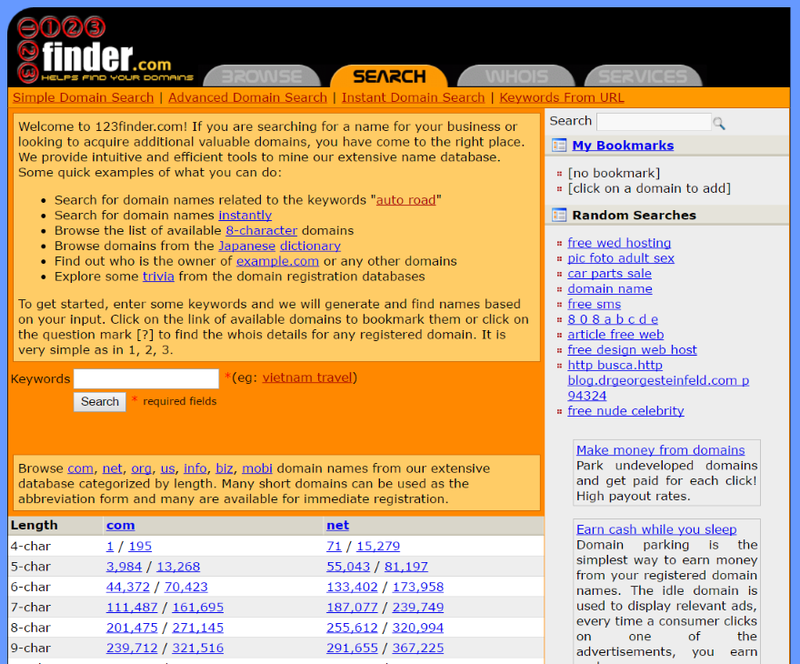 Type in a keyword you want your domain name to include and you’ll see thousands of .com options. The names will be green if they’re available and red if they’re taken. Click on a registered domain to visit the website. You can star domain names that you like, which will turn them yellow, and then view only your favorites. NameStation lets you type in a keyword and select appropriate tags to help provide names that are better focused. It will list available and taken names within tabs. Filters allow you to see names that contain your keywords, alterations, plurals, your selected topics, invented names, and more. The names are given a ranking. You can even hold contests to get ideas from the community. Domainr provides options as you type each letter. The available domains will be in green with a link to purchase. Clicking on them opens a list of registrars where you can purchase. Clicking a taken name opens a list of options that include making an offer and WhoIs information. 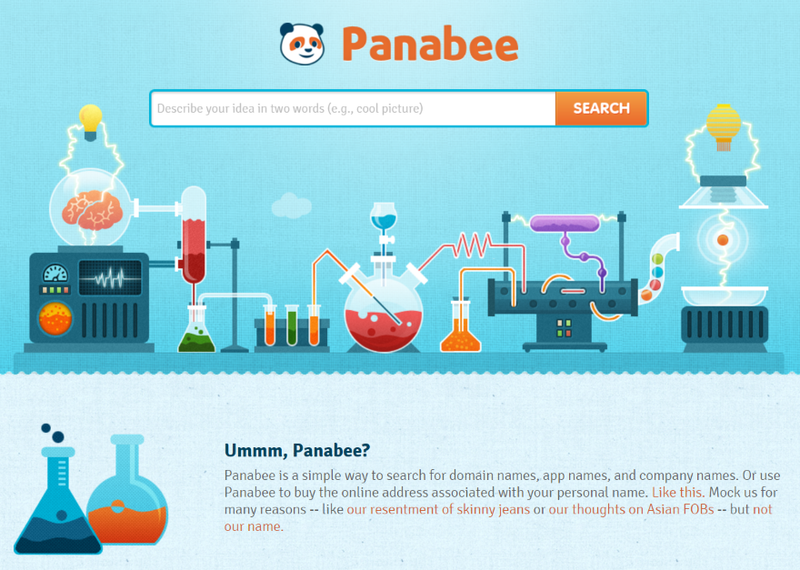 Panabee lets you describe an idea in two words and then gives you a list of domains based on those words. The results are .com’s but you can choose to see other extensions if you want. Each result is displayed with a heart icon. The icon will be blue if it’s available and the domain will include a price with a link to purchase. If it’s not available the heart will be red and broken, and the domain will include a link to see similar names. 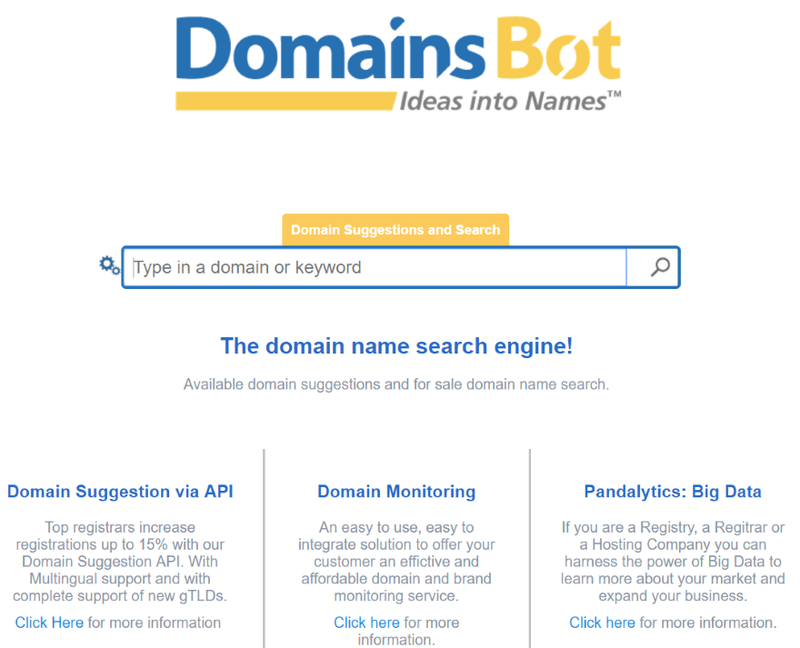 DomainsBot returns dozens of domains based on your keyword and labels them as available, make offer, or provides their price. Each has a link to purchase. You can modify the results by selecting extensions, languages, synonyms, prefixes, suffixes, availability, etc. DomainTyper shows information about the domains by extension. You can see if the domain is available, WhoIs, visit the site, and see its ranking information. 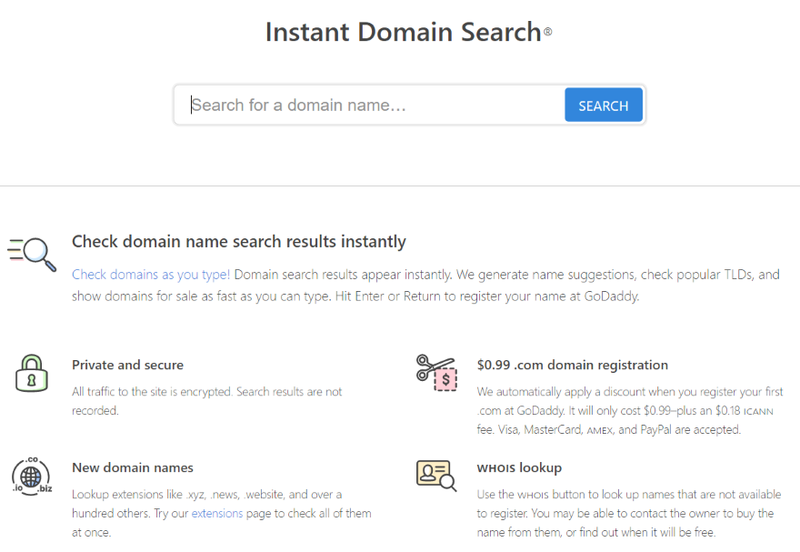 The generated names don’t seem to relate to the keywords but it has a domain hack feature that uses your keyword combined with extensions across the globe to make your domain available. The suggestions are in green if they’re available and red if they’re not. If the domain is available it includes a link to purchase. 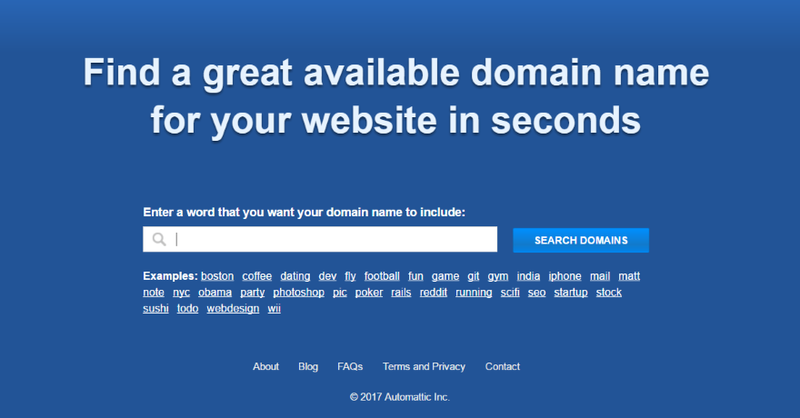 Bust a Name lets you enter lots of keywords and then combines them in various ways to create domain names. You can remove the keywords or select related words, and create groups of words and keep words from being combined. You can sort the results, purchase, and save them for review later. Choose options such as selecting 2 or 3 word combinations, choosing prefixes and suffixes, adding hyphens, pluralizing, and dropping the last vowel. 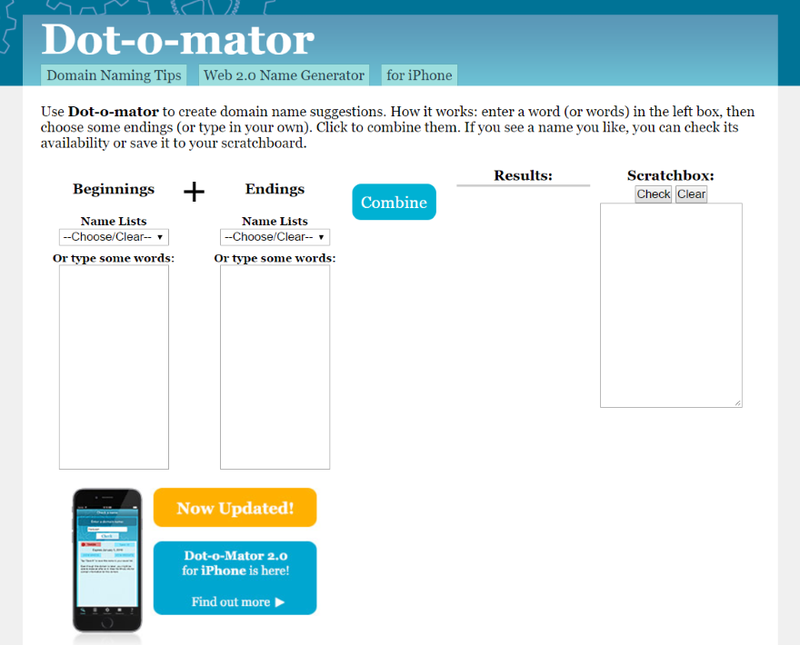 Dot-o-mator combines words based on what you select or type into two fields. The more words you can type into the fields the better. The results will display the number of available names along with the names, and the number of taken names with a button to view them if you want. Clicking on an available name gives you the option to purchase or add it to the scratchbox, which allows you to check availability of multiple domains at once. 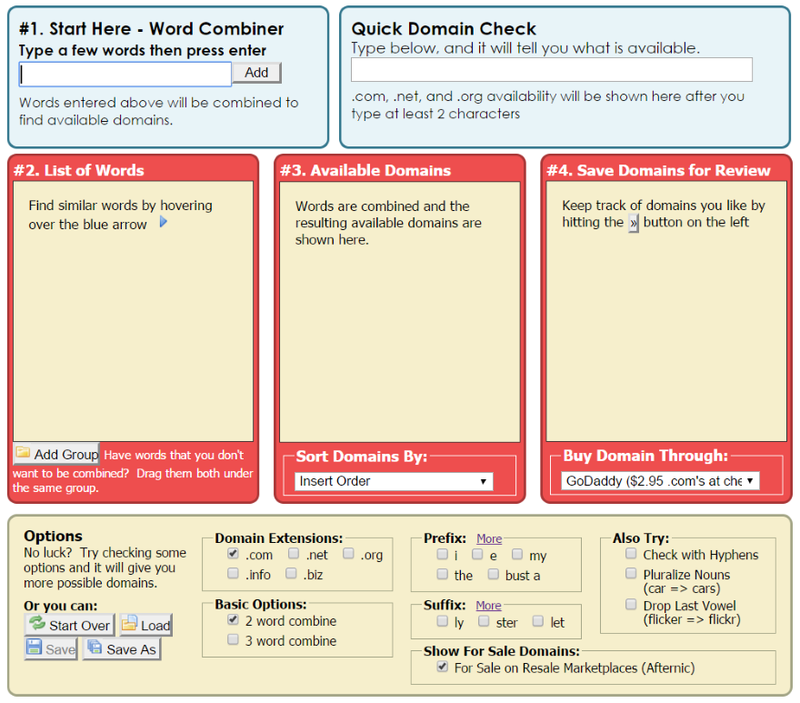 Nameboy lets you enter a primary keyword, a secondary keyword, and choose to allow hyphens or rhymes. The results will display in a table that shows the name and extensions, which will be color-coded according to availability. You can select the extension you’re interested in and then add to cart or make an offer. target=”_blank” rel=”nofollow”Wordoid creates made-up words based on choices you make. Choose your languages (just one or blend up to 5 languages), quality level (its look, sound, and feel), pattern (beginning, containing, or ending), and length (5-15 characters). The results are listed with boxes that show their availability and links to purchase. You can pin them to save to your favorites list. 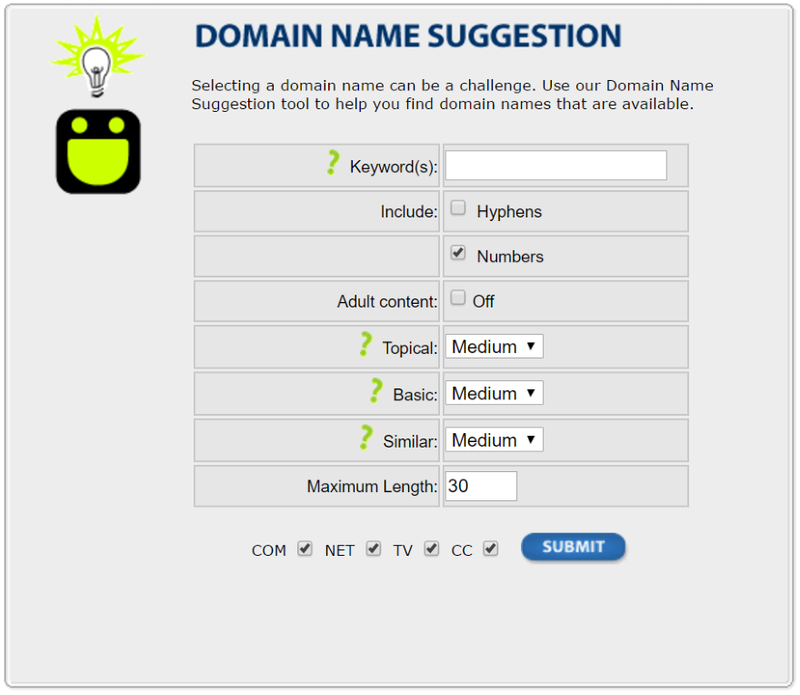 DomainIt Domain Name Suggestion tool allows you to enter keywords, choose to include hyphens and numbers, select adult content, choose topic, basic, and similar filters, maximum length, and extensions. The results are listed by extension and include prefixes, suffices, topics, etc. Each one includes a button to add the name to your account. 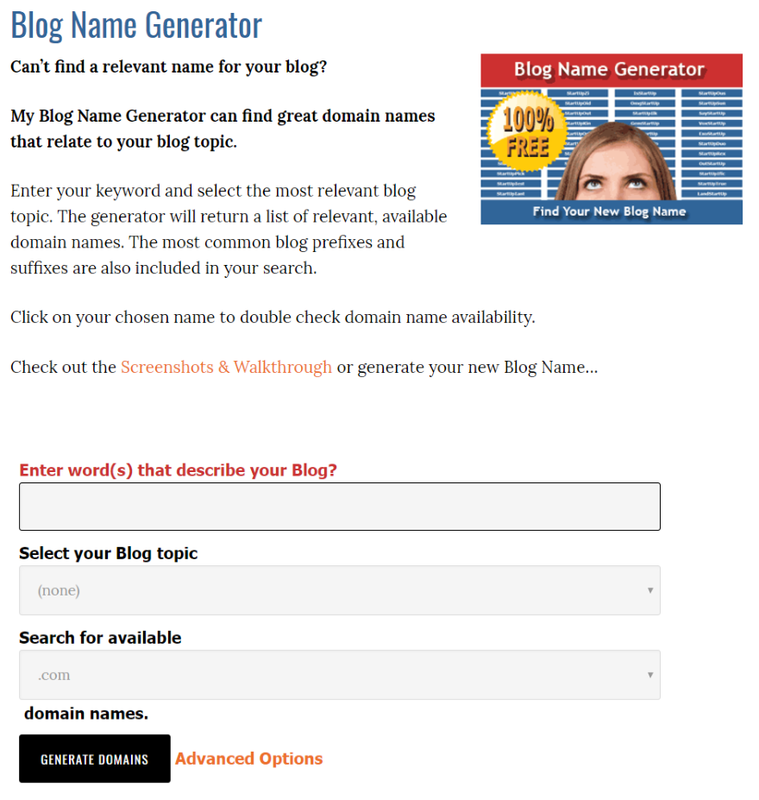 Cool Name Ideas lets you enter keywords that describe your blog and then choose your blog’s primary topic in order to generate names. It returns thousands of options. The results display your original keyword in one color and the added words or letters in another color. They’re listed alphabetically. Clicking a word opens a popup that shows if the domain is available and if the user name is available on Twitter. Domize is complicated but it allows you to use commands to determine the types of results you want. Using the commands, you can make it return synonyms, rhymes, numbers, parts of speech, endings, colors, phonics, and lots more. Results are listed with extensions that are color-coded according to availability. Hovering over the extensions gives you a popup with prices and links to purchase. Impossibility lets you choose between 4, 5, and 6 letters, and between adjectives, verbs, and nouns – adding them to the beginning or end of your keyword. The available results are displayed in short a list with your keyword a different color. Each name is clickable so you can click to make a purchase. 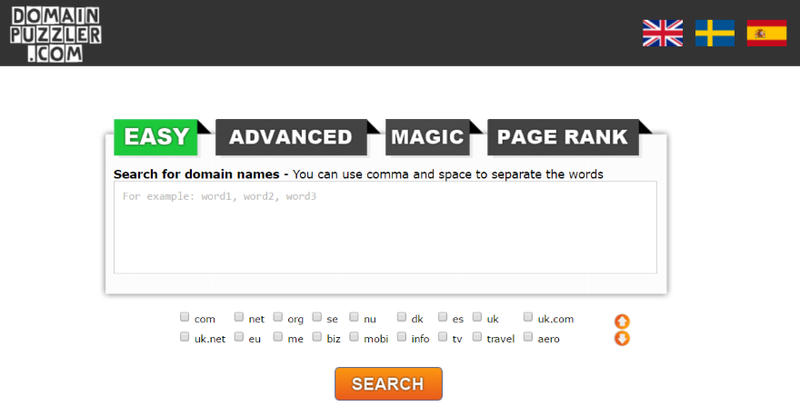 Namesmith displays results from your keywords within categories. Categories include exact keywords, musical blends, artistic blends, rhymes, pre-/suffixes, and modifications. Each includes available extensions. You can star your favorites. It also has random names. You can choose between modern, Greek, Japanese, and Aztec. Each name includes a button so you can click to purchase. 123 Finder allows you to enter your keywords and then view the results alphabetically. The results screen includes more choices such as names that relate, contain, start, or end with your keywords. You can also choose the minimum and maximum number of characters and include hyphens and numbers. If the domain name is not available it will show a question mark that displays WhoIs information when clicked. Domain Puzzler allows you to enter multiple domain names separated by commas and then gives you a list of alternate names based on those words. You can add a name to your favorites list. If a name is available it will have a green check-mark. If it’s not available it will have a red circle with line. You can combine names or add popular words. With so few names available it can be difficult thinking up a name for your domain. A domain name generator is a great way to get a head start and can even provide names you never would have considered before and could even create a brand new word just for you. We’d like to hear from you. 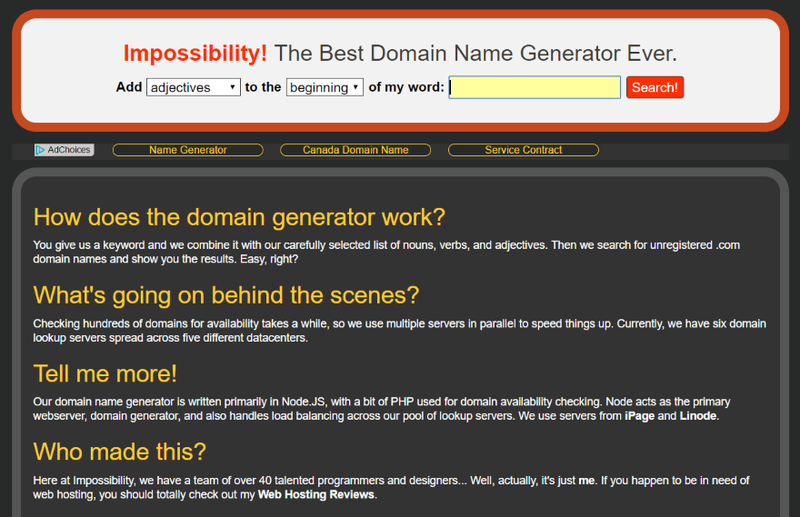 Have you used a domain name generator? Which is your favorite? Let us know in the comments. wow! That’s really a good list. Thank you very much for sharing this. Hi call me paranoid!! Giving the internet is still the wild west how do I know that my search will not end in the domain being registered by a poacher/squatter? It has happened to me in the past. Nice list of suggestions, that are very helpful. Thanks Randy.